Based in Napier, Natalia manages her team to provide infrastructure asset management consulting services for WSP Opus clients. 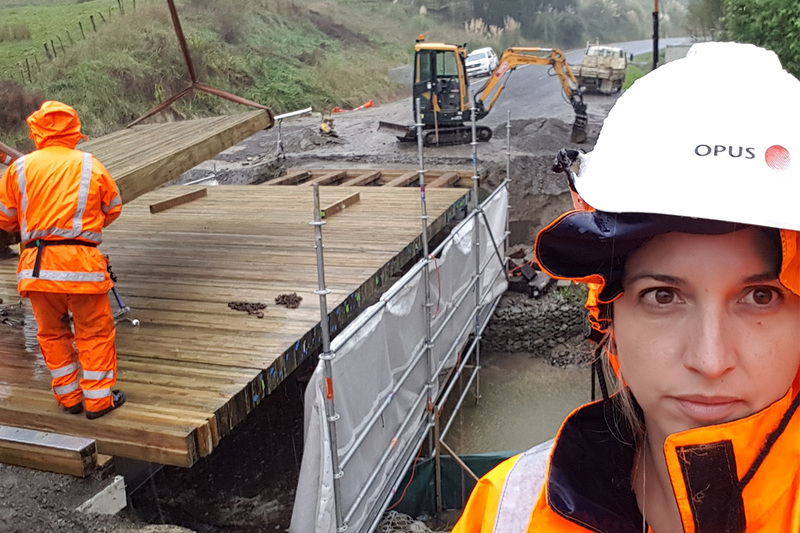 She’s focused mainly on bridges and highways structures, with an aim to ensure they’re fit for purpose and well maintained. All while utilising available resources in an economic and cost-effective manner. Natalia has been exposed to many projects that she’s enjoyed being part of. Whether because of the team, technical challenges, social implications, innovations, scale or other. Her most recent one standing out, where she was involved in the bridge strengthening and deck replacement for a local authority bridge. The bridge had insufficient capacity, was very narrow and in bad alignment. Involved from the start, she provided several bespoke options tailored to her client budgets and needs. After several iterations, helping them to choose a final option which is currently being constructed. WSP Opus Group Manager for Bridges & Civil Structures, Natalia Uran . What made you want to be an engineer Natalia? There were a few factors contributing to this decision! My Dad is an engineer and I still remember our chats when I was a child about engineering problems. I particularly recall him taking me to a construction site when I was roughly 8 years old. The contractor was preparing the foundations for a very big shopping mall and it was the moment I got hooked into civil engineering. We went back every week to check on progress – it was fascinating seeing the changes in front of my eyes. While my Dad was fully convinced this was the right career choice for me, my mum wanted me to explore other options. I considered medicine and physiotherapy with the help of my mum’s insight and family friends. However, in the end it helped me to be even more certain that civil engineering was for me! What do you think makes a good civil engineer? Strong organisational skills. You need to be able to optimise and prioritise conflicting demands in a busy environment, to achieve deadlines and see responsibilities through to completion. Strong leadership skills. The ability to clearly and succinctly explain to your team everything from organisational goals to specific tasks is very important. Engineering qualifications are just as essential. The main aspect for me is a strong sound knowledge of engineering first principles. These are the fundamental concepts about an engineering discipline. They help to understand the codes, but also provide the background theory to solve problems. Especially when the solutions aren’t straight forward or potentially don’t even get covered in existing codes or standards! How do you find the day to day environment that you work in? I love my job and the ability it gives me to solve problems. The problems aren’t always of a technical nature – and can also be financial/budget, people related and more. It’s a great challenge. I guess for me, I’ve been very lucky throughout my professional career. I’m likely the exception to the rule as I’ve never personally felt unsupported in what I do. However, I do believe that gender imbalance is certainly real. There are plenty of statics that prove this is the case. An easy one to refer to is the gender pay gap. Women were being paid 9.4% less than males as of September 2017. Thankfully, I do believe times are changing. We’re more aware of the problem and there are more efforts in place to balance the situation. Would you like to see more women in engineering with you? Yes of course! Engineering benefits from diversity. I can see how every member of my team has a slightly different angle or proposal to solve a problem. I fully believe the best innovation comes from a diverse team who contributes different perspectives to the solution. That’s why I certainly encourage and support different programs that create more diverse workforces in organisations. However, I also believe we need to recruit the right person for the job – independent of whether that person comes from a minority or not. Bearing this in mind, we need to start with a diverse pool of applicants to achieve a diverse workforce. This isn’t currently the case. Data from 2015 shows female graduates were only about 20% of the total number of graduates for civil engineering for example. This is what we need to fix. So how can we increase the number of ladies in STEM? Achieving a more balanced workforce requires us to focus our energy and target our programs to school age girls. Ideally Year 10 and under. Barriers come early. Girls are rarely encouraged to study math or science and there is this general deep-rooted bias that boys are better at those subjects. Even if they manage to overcome this first obstacle, they can then be daunted by being the only girl pursuing a STEM career or concerned about possible discrimination. That’s why we need female role models or mentors that can help young women navigate and ultimately overcome any concerns about pursuing a STEM career. While this approach doesn’t offer any short-term gains, it should mean a more diverse pool of graduates in less than a decade. At the end of the day, if you’re passionate about engineering – then don’t let stereotypes stop you from pursuing this awesome career! There’s loads of opportunities out there. We have a huge shortage of engineers, so it doesn’t matter if you’re male or female. Only that you’re a qualified engineer!